Our Virtual Printer works with POS printers. The Virtual Printer can send a print job to any hardware printer, extract text from the data, make PDF or raster formats, or transfer data as is to a hardware POS printer. All POS data remains intact in the printer job, so they are correctly handled by a POS printer. The main difference between our driver and others is that our driver keeps all POS data intact so that when you redirect output to a laser printer, you will have a normal text printout. However, when you redirect this job to a POS printer, it will use all commands as expected. 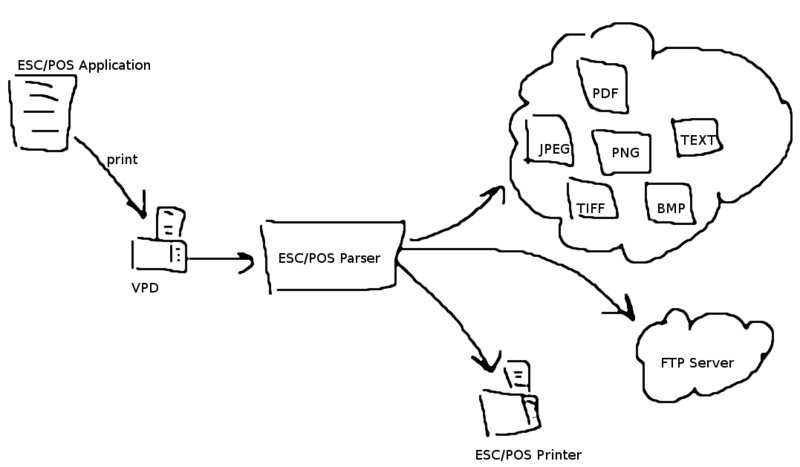 Our driver also can extract text from a POS printer job and pass it to a custom client application which can do anything you want: save as a file, send by e-mail, or store into a database. And of course our driver can generate PDF or raster formats for you.